Are you an iPhone geek? An Android phreak? Are you holding out for the Palm Pre? 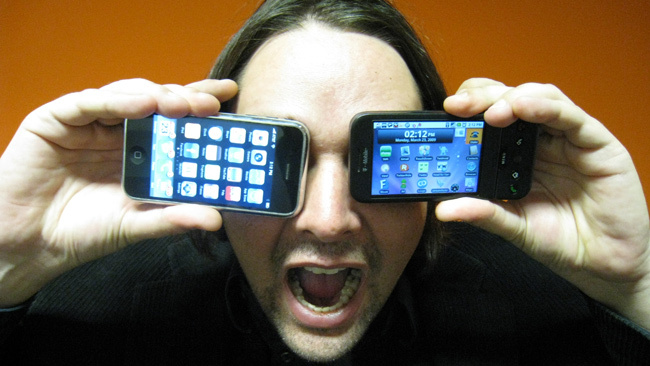 A lot has been said about the emerging battle between the “smart-phone” platforms. There are a bunch of ways to line the various options up against one another, and to help shed our own light on the subject, we’ve decided to break down features and functionality offered on both the the iPhone OS and Android platforms. I’m Jory Cameron, an Intern at Roundarch, and I’m going to share what we like, what we want to see, what is happening now and what we think separates the two different mobile platforms at the forefront of hand-held consumer devices. Maybe down the road, we will have some more exposure to and additional thoughts on the Palm Pre. Until then… here is a dive into the iPhone and Android platforms, so you can determine which you think is “better”. Google’s Android is completely open-source meaning anyone who wants’ to edit or change something inside the OS can. The main people who manage these changes though are Google, the phone manufacturer, and the cell phone carrier. This leaves a big gap in features, and hardware that Google must fill. For instance Google will have to work with device manufacturers to ensure that their OS works on a variety of different types of hardware, and they will have to cut that OS down to the specific needs of the Manufacturer, Carrier, and Consumer (not to mention the future when we might see Android on other “devices” like televisions, etc). We have seen this demonstrated by the Microsoft and their Windows Mobile V6 (don’t worry Microsoft, you’ll get there!) This could leave a big gap in feature varying from phone to phone. One phone could have internet tethering enabled, while another phone has stereo Bluetooth. Also, user interface changes could occur from phone to phone making the OS look, feel and behave totally different on each phone. If managed properly by all parties involved, these risks can be reduced, however it looks as if it might be a challenge (knowing how the carrier-driven market in the US tends to work). But the bright side of being open source is that Google lets us, as developers, freely distribute our applications, unlike Apple who can deny your app from being put in the only “legal” source of distribution. Apple’s iPhone OS is managed solely by Apple. Apple controls everything, which isn’t surprising considering they have this same approach to most everything that they do. What Mr. Jobs says goes. That’s the bottom line. Being in control means that Apple knows exactly what is going to be on their OS and what the hardware looks like for all users. There are very few software casualty’s displayed by this. In fact, the only one that I can think of is that of tethering (which will vary from carrier to carrier). The bad thing about Apple managing all of this is that they can pull certain features and capabilities from the OS for as long as they feel necessary (cough… MMS… cough). Software is software, though, and becuase of this, there are always means of activating some of these features, as well as getting non-approved applications installed on your iPhone (if apple doesn’t approve it). This is not supported though, and is outside of the bounds of Apple’s licensing agreements. The primary way to circumnavigate the restrictions put into place by our friends in Cupertino, is “Jailbreaking” your iPhone, which allows the installation of third party applications and enables third party development. Apple is trying to take away the right to “Jailbreak” their devices, because they are saying it violates the EULA, and there is talk of prosecuting individuals for editing the expensive software that you paid them for (tisk, tisk Apple). The main thing to know out of all of this is that apple knows what they want, and where they’re going with it, while Google is still searching for its path. In saying all of this, I am not going to say that one or the other is going to beat out the competition just yet. It is too soon to tell, and with other platforms such as the Palm Pre due to hit the market, we will just have to wait to make a final judgment. Copy, cut and paste across all apps. Even supports copying photos into messages. Landscape keyboard on all apps that make use of a keyboard. Push notification via Apple servers. In-App Purchase within paid apps and games. Core Location now supports turn-by-turn directions. Apps will be able to communicate with accessories. Across the board Spotlight search. Maps now accessible via API. In all, 1,000 new APIs. Loads of minor feature tweaks such as YouTube account support, iTunes account creation, VPN, Proxy support, Note syncing, meeting invites, call log … and much, much more. As you can see most of these new features in iPhone 3.0 were already widely available through the process of “Jailbreaking”, and frankly, long over due. Also there is one key feature missing in Android thanks to Apple, the illustrious MULTI-TOUCH. The hardware available on Android right now, is pretty much just the HTC Dream (G1 or ADP1 and the HTC Magic.) Of course, by the nature of Android (and what we hear from the industry) there will be much more hardware to come as far as variety and improvements in both screen size, form factor and other aspects of industrial design. The word on the street is that Motorola and a handful of other device manufacturers are gearing up for Android-based smart phones. The hardware available for iPhone OS right now is the iPhone (1st gen) and the iPhone 3G, and there will most likely be a new iPhone released this summer (were hoping to see something that says “WOW” and gives us back the warm fuzzies that we all felt with the first iPhone launch). 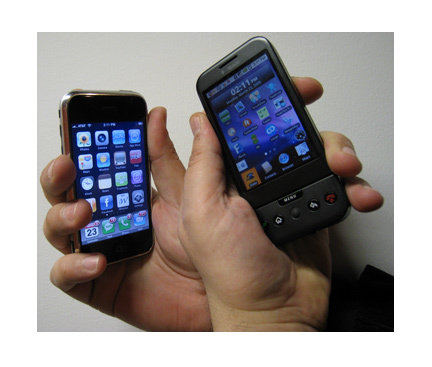 In comparison hardware features for the Android and the iPhone are pretty much just the camera, ram, on-board memory, and the HTC dream/Magic handy little track ball, a highly underrated feature that seems to have made G1 users quite happy. The track ball is really handy to have on the android right now, because we don’t have multi-touch (so there is no pinch to zoom, or tap, etc) you can toggle this tack ball and it makes navigation a lot smoother with in apps, like the Opera Browser. From what we understand, other mobile device manufacturers are experimenting with other joystick or control-pad interfaces. As far as camera goes the Android platform has started of strong with a 3.2 MP camera built into the devices that we have seen, while the iPhone lags along with just a 2 MP camera and no native support for video. Why Apple would make that decision, we have no idea. Device memory is a sad subject at the moment, as the iPhone starts out a 8gb, and the android pushes 128 MB on the phones that have been released to date. The android devices seem to be making the preferred data storage that of a Micro SD card instead of flash memory that is built in. There is one more little problem I have. The batter life of both phones could be greatly improved. On the iPhone I can barely push through a day, on the ADP1 I can barely push through 4 hours. I’m not going to say a bunch about it because I understand the issue and that mobile battery life has been a challenge for many manufacturers; all I am going to say is “please fix it”. The Samsung i7500 Android mobile phone may boast a 5 megapixel camera and a short leaked demo film on YouTube. Another very exciting development is that Android net-books might be right around the corner. Right now, there seem to be a few different companies that supposedly have an Androidbased net-books in development. I’d think that televisions, and even cars might be next. Apple needs to grow up and give us want we want, don’t just think that because you’re the only one who has it you should just make it as perfect as possible and then release it to crush the dreams of all other device manufacturers. Google needs to figure out where they are going and throw in a few more features (mainly multi-touch and a better web browser). Doing so will put them at an equal level in terms of desired functionality. At the moment multi-touch is only available though hacked version of the Android OS. The Apple onscreen keyboard has become a staple of the device’s user interaction, but why not implement both (pull out QWERTY and on-screen) like android? This is especially important when going after users who prefer the touch experience of real keys. Sure, the Android on-screen keyboard has a bit of a lag right now but they are still being applaud for it! Take that step Apple! Take it! App distribution: Android Market or App Store, which is better and why? First off I would like to say as of this moment I am bias toward the iPhone app store. If you look at the UI you will see the app store is much better. Why? Well, the app store has Photo previews, and a design that helps readability. Not to mention, because it is more mature and has been around longer (as well as having a larger user market) the iPhone has better applications and a more worthy review system. The Android Market doesn’t have a very good search ( EX: Search aHome or aHome Lite and about 60 themes come up before the application that actually has that name). The iPhone App Store and Android market both have a problem when it comes to individual developers and distributing their apps. Sure they both add the apps to their respective stores, but after that they just let it manage itself. This means that when you search (Task manager) 500 results come up on top of this poor guy’s application called “Task Manager”, when in fact, he has the best Task Manager application available. I have to say that really annoys me. Give me the a way to sort my results so that I can get to the best apps fast. Depending on the application and how much RAM it takes up, I would have to say both the iPhone and Android operating systems have a decent balance in performance. It isn’t fun to talk about only good stuff, so for now, I will but my appreciation on the table and do a little bashing of a few of the most expensive applications in the Apple store. When it comes to these apps that remote control your desktop or bake a pizza they seem so great that you’re willing to pay $30.00-$50.00 bucks for them. So you use them a few days and all is well until you get a text message. You are forced to exit the application to read the message, and then when done, you ago straight back to it, causing a springboard virtual memory panic, which in return reboots your phone. 15 minutes later you go back into the same app, and bam… you happen to get a phone call (afterall, it IS a phone). Problem? The same exact thing happens. So now that you’re upset, what do you do? You leave the app on your phone just to say you have it, and when your friends ask if it’s cool you say, “yes it’s awesome” while you think to yourself angrily that you’ve wasted your money and time on an application that seems to taunt you with bad performance and memory management. You want to use it, but you know that launching it will just continue the cycle. Frustrating! At least my Android asks me to end process instead of making me sit through at 5 minute re-boot. There is a little problem arising with Apple’s iPhone application distribution. Piracy. (and not the kind in Somalia). Apple’s app store faces a big battle with cracked IPA’s being distributed regularly , although they just hit the 1 billion app’s sold mark, they most likely hit a billion apps pirated before that. One iPhone developer actually took charge by polling versions of the cracked apps. iCombat, from a huge ratio of pirates to legitimate users: Nearly 5:1 for the app’s first week before leveling out to about 1:1 later om. Five times as many pirated versions of the application than legitimate purchases. This just shows how big the market and demand has grown for mobile applications and robust platforms that can provide the backbone for developers like our team at Roundarch. At the moment the Android doesn’t have many piracy issues (it seems), but with a gain in popularity and with new Android devices hitting the streets soon, this may change and also become an issue for Apple’s competitor. Wrapping things up, I hope you got at least some information, or speculation on these two mobile operating systems and hope that my research (and opinions) will help you form your own stance on which platform is right for you, or for the projects you are working on for your clients.